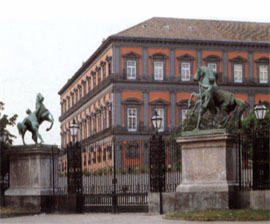 The Royal Palace of Naples was not built by the Bourbons. Its construction was ordered and begun in 1600 by the Spanish Viceroy Fernando Ruiz de Castro for a visit (never made) of the new King of Spain, Philip III Habsburg (son of Philip II) to the Viceroyalty. If we pay attention to this palace, this is due to the fact that the Bourbon greatly restored and embellished both the palace and its surrounding area, which under Ferdinand II took the enchanting aspect it still has today. 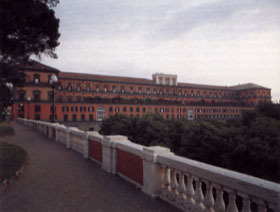 The Palace was built in the vast area between Santa Lucia and Castelnuovo; the general project was given to one of the most famous architects of that time, Domenico Fontana, who had already built the majestic works commissioned by Pope Sistus V in Rome; but the work continued for decades and in many cases the original design made by Fontana was modified. However, for the whole sixteenth century, the palace and its vast “Palace Square” were the beating heart of social and political life in Naples. When King Charles came to Naples in 1734, the palace was abandoned and completely lacking all necessary furniture to house the King and his Court. The situation was so serious that the Court had to buy furniture, curtains and furnishings at the pawnshop and from private citizens [See A. BORRELLI, Il Palazzo nei secoli, in Il Palazzo Reale di Napoli, Arte Tipografica, Naples 1987, pp. 23-32 (p. 29). 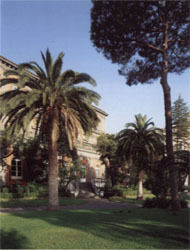 See also: Il Palazzo Reale di Napoli, a cura della Soprintendenza per i Beni Ambientali e Architettonici di Napoli e Provincia, Electa Napoli, Elemond Editori Associati, 1995. We quoted all information from those volumes]. Architect Ferdinando Sanfelice was tasked with the construction of an apartment for the First Butler in the eastern wing facing Castelnuovo; in 1742, then, he and engineer Casimiro Vetromile made other restorations. to decorate some of its rooms (in particular, the Diplomatic Hall, also called First Antechamber of his Majesty); among them, we mention: Francesco Solimena, Francesco De Mura, Nicola Maria Rossi, Domenico Antonio Vaccaro. That same year, a porcelain manufacture was inaugurated, the first “specimen” of what had to became later on the glorious Capodimonte manufacture. In 1751 the Royal Palatine Printing Works became operative and received machineries from the famous typography of Raimond di Sangro, Prince of Sansevero, whereas in 1753 Vanvitelli was tasked with the restoration of the facade built by Fontana. King Charles never became fond of this Royal Palace, although he lived there, perhaps because he was too vexed by the chaotic life of the capital or because that construction was “not his” work. In his mind and heart, he already had other two royal palaces, Caserta and Capodimonte: and therefore the work was resumed only under the rule of Ferdinand IV. A long building, the Braccio Nuovo (New Wing) was constructed facing eastward and occupied part of the gardens, where the National Library is presently located; then the part facing the sea was begun, but remained unfinished and just the first six spans with balconies were built. In 1769 Ferdinando Fuga definitively transformed the Great Hall of the Spanish Palace used by the viceroys to host shows, into a small Court theatre, inaugurated by a Serenade or music theatre feast by G.B. Sassi and music by Giovanni Paisiello. This theatre mainly hosted special shows for the King made by Nicola Piccinni, Domenico Cimarosa and Paisiello. Always under the supervision of Fuga, in 1770s the halls were decorated; the painted doors and the tapestries of the Royal Manufacture still held in the palace date back to this period. 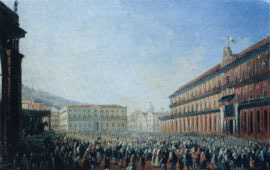 In 1773 the King transformed the area in front of the palace into an area for military parades and destined the Piazza Castello to the traditional popular festivals previously organised in front of the palace. In 1767 the Military College was established, in 1778 the Academy of Arts and Sciences and in 1785 the Great Archive began to be ordered. A Porcelain Laboratory was brought back in the yard of the riding track, after Charles moved the manufacture to Capodimonte. The direction of work was given to Domenico Venuti in 1781. In 1782, Ferdinand inaugurated a Steel Factory with the help of Viennese masters, and this factory too was put under the supervision of Venuti. After 1815, Ferdinand I called Canova to his Court, and ordered him a statue of Charles; in 1819 Canova was also tasked with a statue depicting the King himself; but Canova was then very old and sick, and could only shape the horse; the statue was completed by Antonio Calì and the two monuments were put in the square in 1829. The palace was completely restored during the kingdom of Ferdinand II [this information is quoted from “Il Palazzo Reale di Napoli negli anni di Ferdinando II. La riforma generale, le tappezzerie, a cura di N. D’ARBITRIO-L. ZIVIELLO”, Ministry of Cultural Property and Activities, Monuments and Fine Arts Office of Naples and Province, Royal Palace – Naples, (with the contribution of Their Royal Highnesses the Duke and Duchess of Calabria and the Sacred Military Constantinian Order of Saint George), Edisa, Napoli 1999, pp. 9 and following]. Since the very beginning, many projects were produced; then in 1836, by a Royal Rescript, the Senior Butler, the Prince of Bisignano ordered a general survey of the Royal Palace to “decide about future work” to be started the subsequent year. «In this way, at least formally, one of the most complex architectural res torations undertaken by the Bourbon family was started and it would be concluded in an almost emblematic way immediately before the death of Ferdinand II» [Ibidem, p. 10]. The entire operation of general restoration was called “Reduction” and the name was not chosen by chance: «in fact, an architectural identity had to be built by eliminating and demolishing all elements constituting the powerful building curtain which run all along the St. Ferdinand and St. Charles’ wing, where the Old Palace of the viceroys was a clashing presence (…). «The policy implemented by Ferdinand II aimed at centralising the various powers of the State within the Palace, and in so doing recuperating a model of representative architecture whose functions could be visible and acknowledged and that could be naturally situated in an urban environment» [Ibidem, p. 11.]. The work to be done was a huge one, since the disorderly building produced and stratified over time had caused the survival of all sorts of activities within the palace walls and even the settlement of families who claimed a years-old right of residence in the palace. But the most relevant need to be met was of course the fact that this “General Restoration” had to be in tune with those innovations gradually established in the whole city of Naples after the first Industrial Revolution. its time, opened towards those new technologies needed to make up for the lacks of the craftsman systems that had survived unchanged up to the beginning of that century» [Ibidem, p. 12]. Therefore a radical modernization of services and systems was planned according to the efficiency criteria typical of the dawning industrialisation: gas lighting, advanced fresh-water distribution systems, steam machines for hydraulic services, new drainage and sewer systems, zinc plates instead of roof tiles, advanced foundry products to be used in the construction of the Belvedere Bridge and lighting systems, waterproof plastic products for critical joints, glasses and mirrors with a protective coating etc. were introduced. All this was carried out under a constant control exerted by the king, who created ad hoc committees all along the two decades in which this “Renovation” was realised. Ferdinand II chose Gaetano Genovese as architect to replace Antonio Niccolini who had been the chosen architect of Ferdinand I and Francis I. Gaetano Genovese «worked out and designed a renovation of the Palace according to a grand and beautiful project that he submitted to the King’s approval» [C.N. 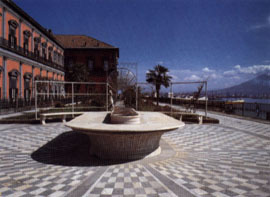 SASSO, “Storia de’ Monumenti di Napoli”, quoted in ibidem, p. 15.]. This project was mainly based upon an idea expressed by Fontana, which in turn met the King’s conservative vision. 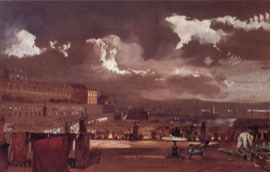 We must also remember that in the second half of 1740s, once the royal apartments had been already made habitable, the riding area was “reduced” into an English-style garden – «sinuous and penetrating as the romantic cultural trend suggested» [“Il Palazzo Reale di Napoli negli anni di Ferdinando II”, quoted, p. 53.] under the lead of the “botanic gardener” Federico Dehnhardt and with the help of a botanist, Gussone. This English garden was counterbalanced by a neoclassic suspended garden, the Loggia del Belvedere, that was hanging in space and overlooked the enchanting landscape of the Gulf. 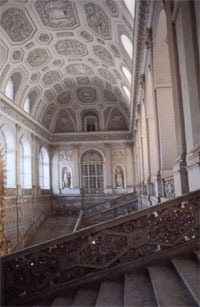 Mention must be made also of the wonderful “Scala Grande” (Main Staircase) with its “Grande Lamia” (roof), the furnishings and the precious rugs (produced some in Belgium and some at San Leucio). One of these rugs has been recently restored by initiative of Their Royal Highnesses Prince Charles and Princess Camilla of Bourbon Two Sicilies, Duke and Duchess of Castro.